In my Feb-March ramblings I was musing about how I like to stay positive and anticipate what’s ahead rather than wallowing in the January blues. Now, as if by magic, here we are in late March and it’s a beautiful Spring day! Blue sky, a bit of warmth from the sun and people smiling as they walk around, instead of scurrying along, heads bowed against the wind and rain. It’s so refreshing, even as an early-bird, to wake up in daylight. This is a lovely time of year to get out and enjoy the great outdoors. There’s always a new walk to try in every issue of INSIDE, and often a suggestion for a day out or two, as well as all the events listed in the INSIDE Guide. Also, remember we’re always on the lookout for good local photos for the cover, so if anything catches your eye when you’re strolling around, snap it on your phone and send it in. With Spring in the air, you might feel moved to get a few jobs done around the house and garden. Where better to look for someone to help with your project than in your local magazine? Happy reading. 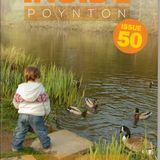 Inside Magazines, 352a Park Lane, Poynton, Cheshire SK12 1RL. email: info@insidemagazines.co.uk www.insidemagazines.co.uk Ducks in a Row by Michael Lacey. Inside Bramhall is produced by Inside Magazines Ltd. We cannot be held responsible for views expressed by contributors or any advert content, including errors or omissions, or endorse companies, products or services that appear in this magazine. We endeavour to ensure that all local information given in this magazine is accurate, but we cannot always guarantee this. © Copyright Inside Magazines Ltd 2019. Material from this magazine may not be reproduced without prior written permission from Inside Magazines Ltd.
Where does the time go? I can’t believe it’s nearly a year since the last fabulously sunny fun day in Bramhall Park. On Sunday 19 May, Bramhall And Woodford Rotary Club is once again organising this event and everyone’s keeping their fingers crossed for a repeat of the weather! Last year, hundreds of families turned up on the day many of whom used the increasingly popular DUCK BUS Park & Ride service. This year we will have three (yes, three!) free buses running throughout the day between Bramhall Village (Pizza Express) and the Park plus Hazel Grove High School via Stockport Rugby Club. A new route will run from Church Road, Cheadle Hulme with parking available at the two local schools. Track the buses with the app on our website, then look out for the yellow DUCK BUS and jump on board. Please use the buses if you can, but if you do come in a vehicle, please park carefully and respectfully. Extra parking will also be available at Linney Road Scout Hut. 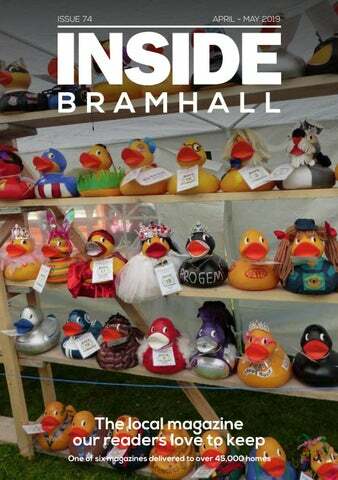 The fun starts at 11am, with a variety of duck races to watch. Local celebrities and businesses get involved in the speciality races by decorating large plastic ducks, which go beak to beak in the river. As well as Duck Racing, with some fabulous prizes for the winners, there will be many sideshows, a bouncy castle, games, singers, dancing groups and craft stalls. The Dave Egerton Big Band will be performing in the walled garden and there will be much more, including ferret racing and the rideon train. The money raised will be shared between Beechwood Cancer Care and the Together Trust, both well-known local charities doing fantastic work, and other charities supported by the Rotary Club. ART AND CRAFT MONDAYS AT BRAMHALL METHODIST CHURCH Our well-established Art group has recently welcomed craft people to join them on Monday afternoons at 2pm. You might like to come along and take up your paint brushes again, or materials could be provided to see whether you’ve still got your artistic touch. We are also trying to encourage people to bring along their craft projects and work on them in pleasant, welcoming circumstances. The crafting is a new project and we are offering Quilling lessons to give this aspect a bit of a boost – again all materials will be provided. ADLINGTON WI Meet like-minded enthusiastic women in the area and make a difference locally. Adlington WI meets on the first Tuesday of the month to hear an excellent speaker, as well as offering craft classes, table tennis, Mah Jong, lunch outings and more throughout the month. Pop in to see us and be sure of a warm welcome, good company, a drink and a slice of homemade cake! We meet on the first Tuesday of every month, cost is ÂŁ2. For details of upcoming speakers, look at the INSIDE Guide. television, and the stereo, open and close the curtains, which was all well and good until I found out that when an aeroplane flew overhead, it set off the whole system.’ Within a couple of years Best had had enough. In July 1972 he put the house up for sale and moved back in with his landlady, Mrs Fullaway. Three months later the house was sold for £40,000 to Irish haulier Patrick O’Dwyer, who commented at the time, ‘It’s a dream come true.’ The current owner is Harry Yeung, co-partner of the Yang Sing restaurant in Chinatown, who has lived in the house for nearly twenty years. Yeung bought the property in 1999 from Wendy Hird for £400,000. Mrs Hird had lived there with her late husband Bill since 1993. The Hirds had bought the house for £200,000 and, surprisingly, when they purchased the house the details neglected to mention the identity of its original owner. The Hirds only found out the name of its famous former resident from a local taxi driver shortly after they’d moved in, which begs the question: where had the Hirds been living up until then, on Mars? Not much is known about the owners immediately prior to the Hirds, but during their occupation the swimming pool had had its water pipes filled with concrete during one apparent fit of rage. The white glazed-brick which had so defined the look of the house had gone too. In fact, when the Hirds first moved in they discovered the discarded bricks piled-up at the bottom of the disused pond. The house today is barely recognisable from how it looked in the Seventies. The glaring white bricks have been replaced by a more common brick, the roof has been pitched, and there are metal railings surrounding the property, accompanied by a dense privet hedge which provides the property with something that was sadly missing when George Best first moved in – privacy. For more about the locations in and around Manchester connected with George Best, please see ‘Trailing George Best’ (Pitch Publishing) written by Stuart Bolton and Paul Collier. dogs) will showcase their extraordinary talents which transform people’s lives. The ultimate summer festival for dogs returns for 2019 with a bonanza of shows, displays and activities! DogFest, the UK’s biggest and best day out for dogs, their families and animal lovers of all ages is back - with even more for next year! Now entering its sixth year, DogFest will take place in the grounds of Tatton Park on 15 to 16 June. The events once again promise a packed schedule of celebrity appearances and expert talks, jaw-dropping dog displays, educational sessions and fun, have-a-go activities. Everything is geared towards celebrating the amazing bond between dogs and people and promoting animal welfare. All this plus great live music sets, cool street food and shopping galore for pooches and people alike. National treasure and presenter of Crufts’ TV coverage, Clare Balding stars for the first time at DogFest. Famed for her love of dogs, she’ll headline on the main stage with anecdotes from her life – and those of her fourlegged friends. Clare will lead the Great Dog Walk where she’ll chat to people all around the course and she’ll also award prizes at the acclaimed Fun Dog Show. TV’s Supervet, Professor Noel Fitzpatrick, known globally for his ground-breaking work will front a special interactive feature for younger visitors. The world- leading orthopaedic-neuro veterinary surgeon will open The Great Dog Walk and deliver an insightful talk for fans purchasing VIP tickets. Then there’s fun all the way with dog dancing - where astonishing sequences to rival Fred Astaire and Ginger Rogers can be seen. Dog Diving is one of the biggest crowd pleasers at the festival: furry volunteers line up to leap into a massive aqua sports pool, while brand new this year is Fido’s Lido, a giant paddling pool for pups and people alike! Also new for 2019 is the Big Dog Dig, where pups can catch the scent of buried goodies and scrabble away to their heart’s content to get to the loot! A ‘just for fun’ dog show will crown the ‘happiest dog, ‘the one with the waggiest tail’ and so on through to the ‘Best in Show’. DogFest’s guest experts are always a major draw and the weekend will be packed with talks, demonstrations and Q&A sessions on animal health and welfare, veterinary developments, dietary requirements, behavioural psychology and much more. Visitors can soak up the festival vibe throughout the show, with artisan food and coffee vans, gin-tastic bars and other wonderful food and drink stalls. Finally, DogFest’s Shopping Village is a must-see destination for serious retail therapy with food, fashion and fripperies, for man and beast alike. Further information on all shows can be found at www.dog-fest.co.uk Tickets are available from dogfest.seetickets.com/content/ticket-options and the hotline 0871 220 0260. Things to do with pre-school kids Toddler Group 10-11.30am Cheadle Hulme United Reformed Church, Swann Lane. £1 per child including refreshments. Contact Alison Stevens 01625 877180. Tuesday Active Angels 10-11.30am - Term time only Free play and songs including puppets and musical instruments and parachute fun also. Healthy snacks and refreshments for children and hot and cold beverages for adults. St Michael & All Angels Parish Church, Bramhall. Contact Karina: 07969633654 or Karina_lemmon@live.co.uk Story Time 2-2.30pm Cheadle Hulme Library. Telephone 0161 217 6009. Wednesday BMC Baby Chat 10.00-11.15am Term-time only. Bramhall Methodist Church, Bramhall Lane South. Come and join us every Wednesday morning for a chat, tea/coffee and biscuits and the opportunity to meet other mums, grandparents and carers with young babies in the Bramhall area. There’s a small charge of £1 per adult. For further details please call 0161 439 1204. Sunday Messy Church. Second Sunday of every month 4-6pm Bramhall Methodist Church, Bramhall Lane South. See Inside Guide or call 0161 439 1204.
friday Baby Massage & Yoga – morning Bramhall Library Children’s Centre. Combined class run by The Baby Massage Company & Honeychild Baby Yoga. Email babylovesmassage@live.co.uk or call Kate on 07866 468245 for class times and to book (necessary). with our paid INSIDE Guide listings. Call 01625 879611 or email info@insidemagazines.co.uk for further details.